Branding is more than just a logo on a business card or the name of your business/blog. It is your identity. An effective brand tells the world who you are, what you do, and how you do it. In the online world, you will come to be known for your business/blog name – possibly more than your direct sales company (which is a good thing – it will help to keep people coming back to YOU and not just your company) make sure it projects the identity you want to represent. Note: Your business name and your blog name *should* be the same thing. Your blog will again be the central focus of your online presence – linking people to your social media sites, your replicating website, etc. So if you already HAVE a domain (.com) then my suggestion is you build a blog on that domain, and not try and start over. Why do I need to brand my business/blog? The main reason for creating your own brand is to differentiate yourself from your competition – i.e. the millions of other blogs/consultants. New Direct Sales Consultants are a dime a dozen. New Bloggers are a dime a dozen. You need to constantly be looking for ways to set yourself apart from everyone else out there. Your brand can do that for you. How do I brand my blog or business? Decide your Niche. What is the real mission of your blog? Yes – building your direct sales business – but what other niches might you fall into? To decide your niche – think about the things you are passionate about. Are you a Foodie? Bargain Shopper? Home Decor Diva? Special Needs Blogger? Obviously, you will write about a variety of topics, but if you had to categorize yourself into one main niche, what would it be? Having a niche will not only help with Branding, but in building your audience, meeting new people, and having a constant flow of new content. The beauty of being in a niche is you will find people of like interests to begin building relationships with what might in time turn into great business relationships. When you create your brand, you need to keep the WHO, WHAT, and HOW firmly in mind but also use the brand to establish your relevance to your target audience and build CREDIBILITY with that audience. If you have already created one for your business – great! Otherwise, work to design something that you can use to brand both. Your logo is not your brand, but your logo should allow your brand to be instantly recognized by those familiar with it. To this extent, your logo helps create and reinforce brand awareness. Think of your company’s brand – no matter what size, color, etc you see that logo – you will recognize it, right? The logo you create should be able to be used consistently in a variety of different media. It should be suitable for business cards, as well as for your website and all social media platforms. Everything you produce needs to use the same, consistent style of the logo so that, over time, your logo becomes synonymous with your blog. Instant recognition is what you’re going for here, so don’t dilute it by using several different logos for different purposes. You can create one, or even hire someone to do it. I love using Etsy for all of my design needs. 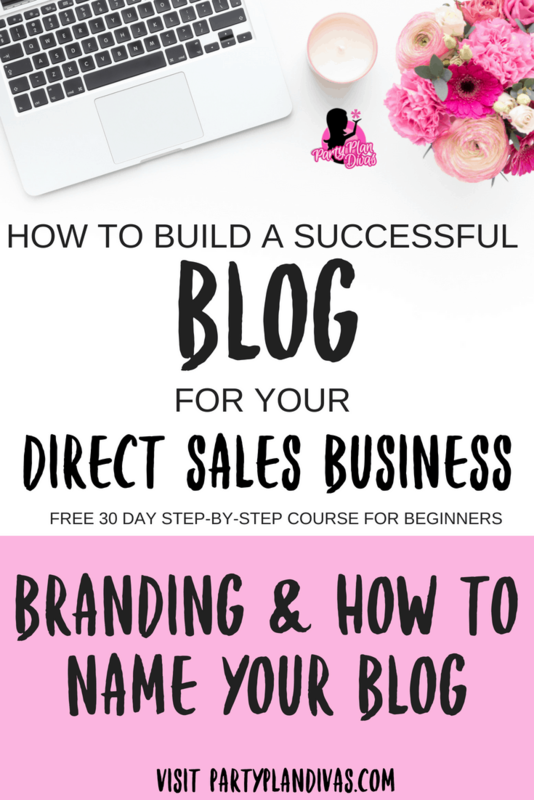 Consistently Use your Blog Name and Logo. To establish brand awareness, this branding needs to be used consistently and frequently in everything your produce, whether that be letters to customers, business cards, advertising, promotion, on your website, and of course, all of your social media outlets. And don’t forget to be consistent in your use of color schemes as well. These can be powerful brand reinforcements. Everything Party Plan Divas is pink and black… even what I wear most of the time when I am speaking. Create a DEMAND for your Brand. Your voice, your opinion, your style, your readers… these are all very important aspects of your brand – and they are what you want to expand your business. You can create a demand for your brand and your blog by staying true to all of these things and building your blog and reputation in the Blogosphere. Customers will seek you out, tell their friends, and remain loyal. Your brand can make the customer’s choice easy. That is the power of Branding! How do I REALLY get my Brand recognized? Repetition – This is very important: keep all of your design elements the same on all of your marketing and business tools. Make sure all of your Social Media accounts reflect the same look and brand. Newsletter – Use your mailing list to push your blog name and tagline. Create a header that contains your domain name and your tagline and logo. Use this same header in all issues of your newsletter. Domain Name – For best results, your domain name and blog name should be the same. Owning your own “.com” is one of the best things you can do for your business and your blog. Email signature – Implement your Brand into your signature file, so with every email you send visitors will be further exposed to your brand. Also, any kind of forum that allows signatures – be sure to have your brand, tagline, and url. Thank you pages – If you have online forms (for customers to contact you, request more information, subscribe to your newsletter etc. ), you most likely have a “thank you” page where you thank visitors for using your form. This is an excellent place to position your logo and slogan. Your Image – With all the talk about branding and creating an image for yourself and your business, consider how you’re representing yourself on Facebook, Twitter, and other social networks. Part of being on the internet is being very transparent – everything you share WILL be seen. “Online privacy” is one of the biggest oxymorons of our time. Make sure that you always conduct yourself as a professional Business Owners so that all customers will want to work with you. Be aware of your LANGUAGE, and what kind of impression you are putting out into Universe. Will some of that social media information pop up to haunt you? You’re building your image wherever you are, in whatever you do, whether it’s in your hometown or online. Consider how you want to represent yourself and your business. Do your words and photos portray you as want the public to view you as a business person? Branding will not necessarily happen overnight. The reality of the matter is that it takes time, creativity, and perseverance. But the payoffs can be huge. At the beginning of your business ventures, come up with a plan. THINK BIG. Think about how your business will grow, new markets you may be able to target, and what you would like people to remember when they hear your name or see your logo. Then fit all of these things in a little at a time. 1. Come up with a few ideas for what you want your business/blog to be called. 2. Brainstorm ideas you want for a logo. Now that you have decided what type of blogger and the direction of branding you want to go, it’s time to pick a URL.